As mentioned in my previous post about the moving and shaking going on at Kirkland’s Carillon Point, Heavy Restaurant Group announced last week the ascension of former bin vivant wine director Dawn Smith, recently named wine manager for their trio of as-yet-unopened Bellevue restaurants. 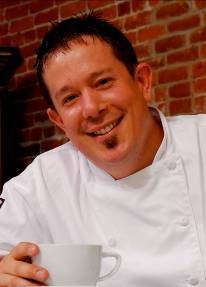 Smith will be in good company when Heavy’s Purple Cafe and Wine Bar, Barrio and Bliss open in the Bellevue Towers mid-summer: turns out chef Mike Davis, late of 26brix in Walla Walla, will be overseeing the action in those kitchens. “It was a great four and a half years in Walla Walla, but I’m excited to get back to the west side,” he told me today. “As a chef, I could not ask for a better scenario than what I have now.” What he has now is a part-time job with Heavy Restaurant Group. And as Heavy gears-up to open Purple, Barrio and Bliss under the same roof, Davis continues to commute to his new job from his home in Walla Walla three or four days a week. He and his wife, Krista, expect to settle down with their 3-year-old daughter in Bellevue or Sammamish before work goes full-throttle this summer.